I have been working away on my Anna Blouse Pattern and am so excited to publish it! It is coming soon! While I have been sewing prototypes of the blouse I thought it would be a great time to share my *Must Have* dress making tools. I started as a home seamstress sewing my own clothes starting in junior high school. (I actually started sewing at the age of 6 - hand sewn clothes for my dolls!) In my early twenties I attended apparel design school where I learned about professional tools of the trade that I'm excited to share with you! These are the tools I use for marking and cutting. * TAILOR'S CHALK ~ I prefer to trace around my pattern pieces and to do this I use tailors chalk. My favorite brand is from Clover. You can find versions of this chalk at your local dress making fabric shop. I keep a few different colors on hand - Red and Blue for light color fabrics and Yellow for dark fabrics. * FABRIC SHEARS ~ You will also need a good pair of fabric scissors. I have a couple pair of gingher shears that I just love. I only use my fabric shears on fabric - cutting paper with them will dull them! 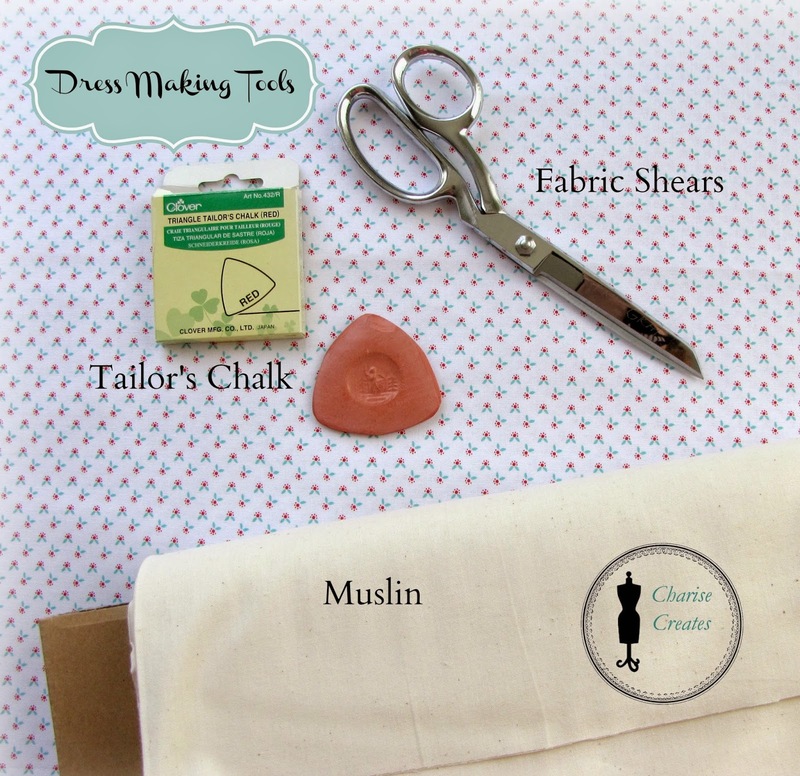 * MUSLIN ~ Invest in enough muslin to make a test fitting garment. This can either be actual muslin or a less expensive fabric that is similar in weight and drape to the final fabric your garment will be sewn out of. I always have a bolt of muslin on hand to sew up an initial garment for fit. If you sew lots of garments it is worth it to make the investment. I buy my bolts of muslin at JoAnn Fabrics when I have a 50% off coupon. Making a test garment (or muslin as it is called in the apparel industry) is so incredibly important. Even if you follow the measurements on a pattern you may want to tweak the pattern a bit. Don't make the mistake of cutting into that expensive final fabric without sewing a test garment first! These tools are great to have if you sew lots of garments. They are a bit of an investment but definitely worth it! 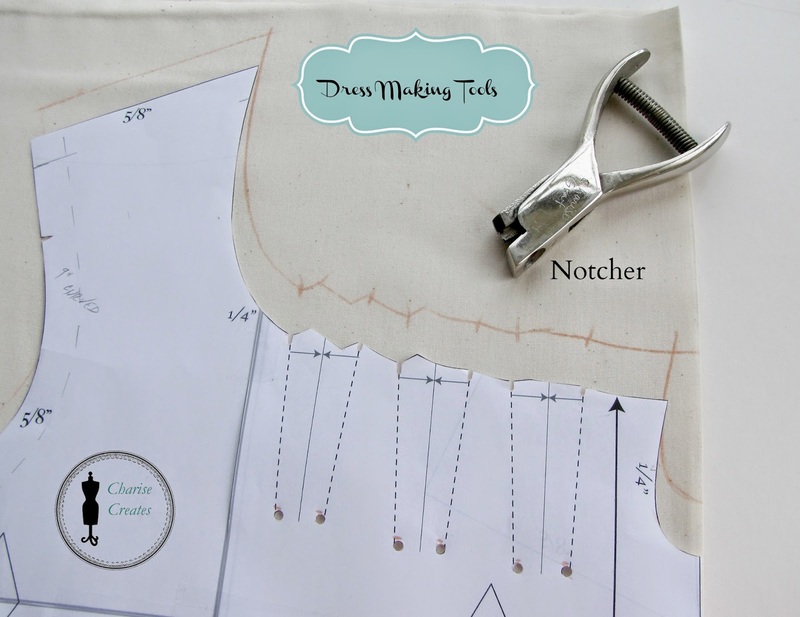 NOTCHER - I love this tool and learned about it in design school! Use it to mark the notches on your patterns. You can find one [here]. You can also use a pair of paper scissors to cut your notches if you are not quite ready to make the investment. BUTTONHOLE CUTTING SET - These are great tools to have as well. 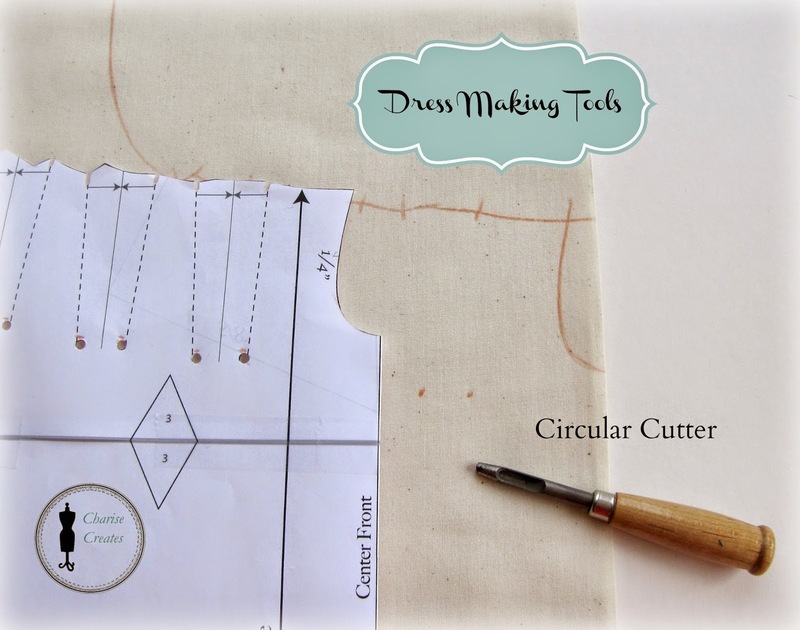 The circular cutter is for cutting keyhole buttonholes but I learned to use the circular cutter to mark the end of darts and tucks on my patterns. You can see the holes at the bottom of the tucks pictured above. Ok...off to work on the Anna Blouse. Cannot wait to share the pattern with you! Thanks for showing us these important tools. The one thing you didn't mention that I think are "must have" is pattern weights. I have a vintage pair of Wonder Weights which are heavy but easy to move around. It has changed my garment cutting to stop pinning and to use these weights.